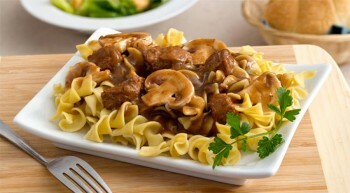 Vanee Roasted Beef Gravy is made with true oven-roasted beef and pan drippings, for a great homemade flavor and appearance. 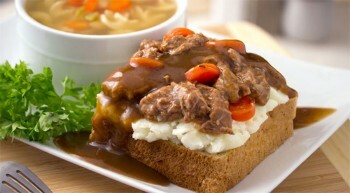 Perfect over steak, meatloaf, beef roasts, french fries, mashed potatoes, pasta, open-faced sandwiches, or used as an ingredient in signature sauces. 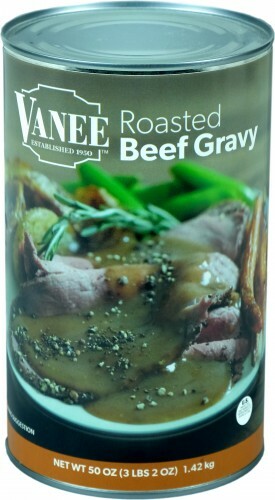 Vanee Roasted Beef Gravy has no added MSG, no high fructose corn syrup, is shelf-stable for easy storage, doesn’t require boiling water, has unparalleled batch-to-batch consistency, and uses real roasted beef. Each 50 oz. can has 23 quarter cup servings, for a total of 276 servings per case. 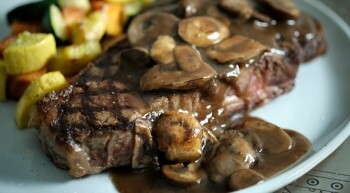 Ladle over beef roasts of all kinds, steak, meatloaf, mashed potatoes, or use to make poutine. Water, Roasted Beef and Beef Juices, Enriched Wheat Flour (Wheat Flour, Niacin, Reduced Iron, Thiamine Mononitrate, Riboflavin, and Folic Acid), Food Starch - Modified, Salt, Onion Powder, Hydrolyzed Corn, Wheat and Soy Protein, Sugar, Caramel Color, Soybean Oil, Disodium Inosinate, Disodium Guanylate, Flavoring.